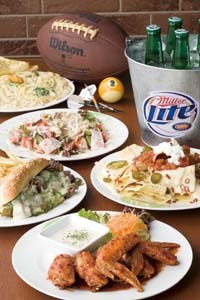 A second American-style sports bar is open in central Okinawa to serve sports lovers of all ilk. Pitsters, known for being the largest full service sports bar on the island with its two 87-inch projection video screens and six televisions, has unveiled its new location on Gate 2 Street in Okinawa City. The latest offerings from Pitsters, which brands itself as a one-of-a-kind sports bar with numerous entertainment options including foosball, billiards, darts, football and Play Station 3, include all the snacks and grilled burgers and a choice of pasta at the new location. The addictively spicy Hot Wings served up with original seasonings is the customers’ favorite. The sports bar’s happy time between 6 p.m. and 9 p.m. features draft beer for $3 and chicken wings for 50¢. Pitsters has added something new on Gate 2 Street, a once-an-hour ‘penalty shot’ time, signaled by a referee’s whistle. When it happens, customers lie on their tables while one of the all-female bartending staff stands hovers over and pours a shot of liquor into the waiting mouth. Pitsters on Gate 2 Street and across from Camp Foster Gate 6 on Hwy 58 at Kitamae in Chatan are both open from 6 p.m. until they decide to close.